The minute I saw the Nutty Masala Rice at Krithi's kitchen, I wanted to give it a try for sure. The next morning I ended up with some left over rice and last quarter of red cabbage (after making those Red Cabbage Sweet Potato Bullets) that gives me an opportunity to try this one. I have added some dry fruits and some more nuts to the base recipe, and the red cabbage gave the nice purple color, that's how i ended up with this Fruit and Nut Purple Rice. Here is the recipe and Enjoy! 1. Take a not stick pan add Urad Dal, Chana Dal, Cumin Seeds, Coriander Seeds, Walnuts, Cashew Nuts, Red Chilies, Cinnamon and Clove. 5. Add the rice and salt and black pepper and mix it well. 7. Add the dried cran berries and raisins and mix it well. Serving Tip: This was prefect for my lunchbox. 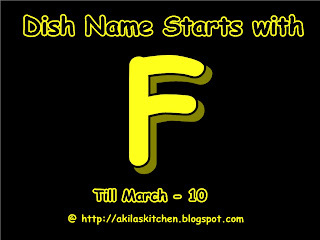 I am sending this to Dish name Starts with F Event at Learning to Cook by Akila. You plate looks so colorful with all the vegetables.. Awesome.. This plate is inviting me. It's so colorful. Very attractive colour and lovely flavours, yummy rice. Thank you Ladies. Thanks for the Idea Krithi.